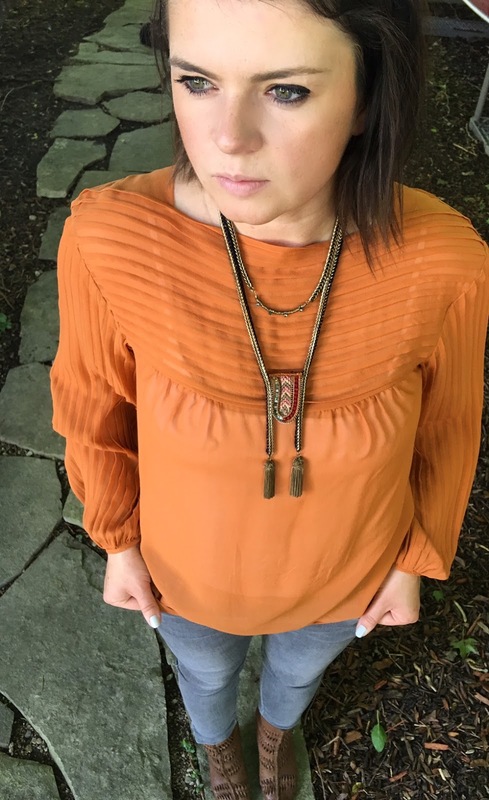 A perfect fall color if you ask me, but that’s not why I picked this top to wear in this post. It’s just that I didn’t really wear it for a really long time, but still love the delicate pleating and the brick-orange hue. Pleating is very in right now, so how perfect that this blouse can see the sunlight again? I originally got it with the intention of wearing it mainly to the office, but every now and then I like pairing delicate, flowy tops with jeans for a weekend look. I am sure plenty of us have tops like this one sitting in our closets that only seem appropriate for nicer events, where we need to follow some sort of dress code, but really those can be paired with very casual pieces and worn outside the office and for occasions other than a nice dinner, church, lunch dates, etc. I like wearing mine even when running errands on the weekend. Wearing: Blouse via Victoria’s Secret (very old; but how cute is this one? ); Anine Bing jeans; Zara necklace; Sam Edelman ankle peep toes. "The most beautiful pleated skirt!"